I guess I just don’t get out that much, since traveling still seems so bizarre. We woke up very early in the morning in Memphis and headed to the airport to fly to New York. We hung out for a few hours in LaGuardia, and were then deposited in Canada. It’s a strange feeling to wake up in one time zone and then put your feet down in a different country a few hours later. But it was a good trip – we all traveled to meet some friends from England who were also visiting Canada. On our first full day in Toronto we ended up driving right out of the city and headed to Niagara Falls. We rented a minivan, since it seemed like the best way to transport all six of us. So after some shenanigans with the rental car agency, we made it past the traffic jams in Toronto and made the relatively short drive south to Niagara. We passed through the touristy town of Niagara Falls, which was reminiscent of Pigeon Forge with its string of tacky stores and kitschy attractions (although we were tempted to stop at the wizard themed mini golf course). But you immediately forget all that once you get close to the falls. 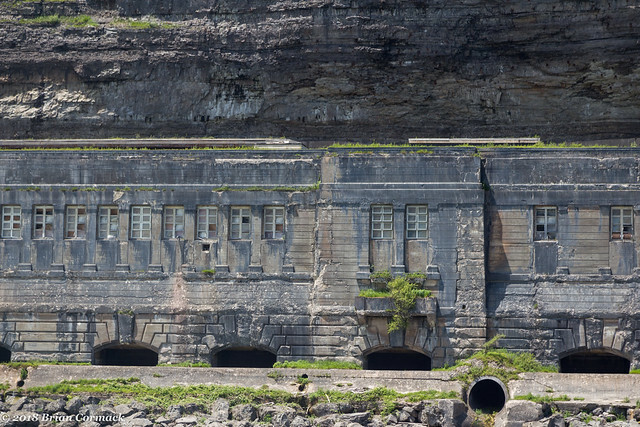 As soon as you approach, you can hear the loud thundering roar of the water. 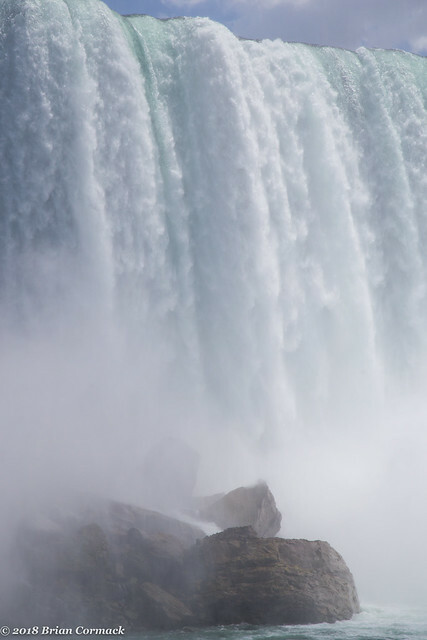 The spray and mist kicked up by the falls hangs above the river like a fog. It’s a pretty amazing view. 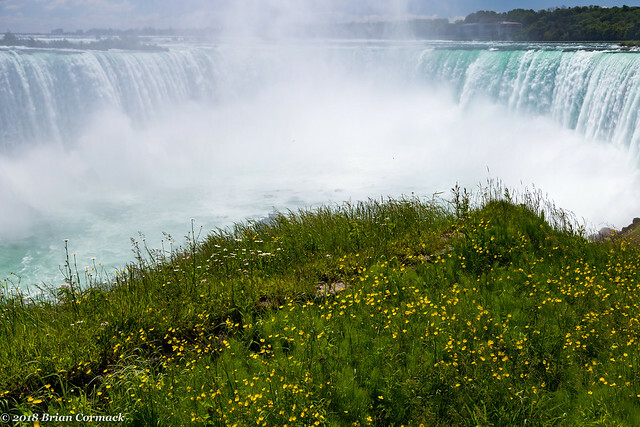 Niagara Falls aren’t the tallest waterfalls in the world, but they are among the most powerful. 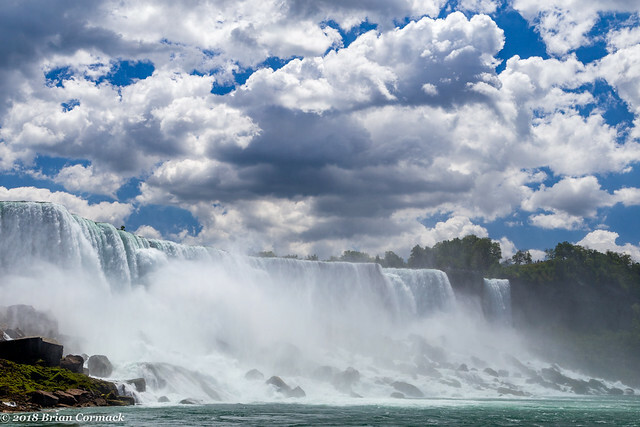 About six million cubic feet of water goes over Niagara Falls every minute. 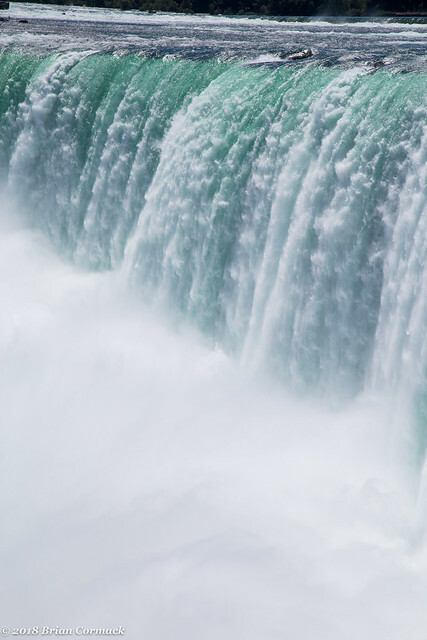 There are actually three waterfalls here, the largest and most famous is Horseshoe Falls which sits entirely on the Canadian side of the border. 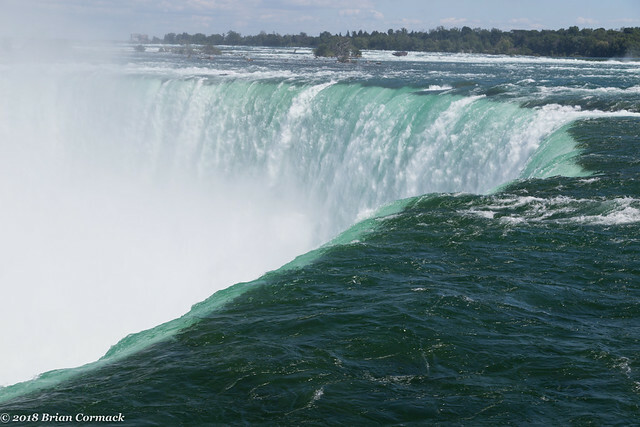 Horseshoe Falls are 167 feet high, but stretch for 2,600 feet. It’s hard to grasp how big the falls are. People on the opposite side of the gorge look like tiny ants (you can only tell there are people there when they’re wearing bright ponchos). Sightseeing boats below the falls look like bath toys floating in the water. 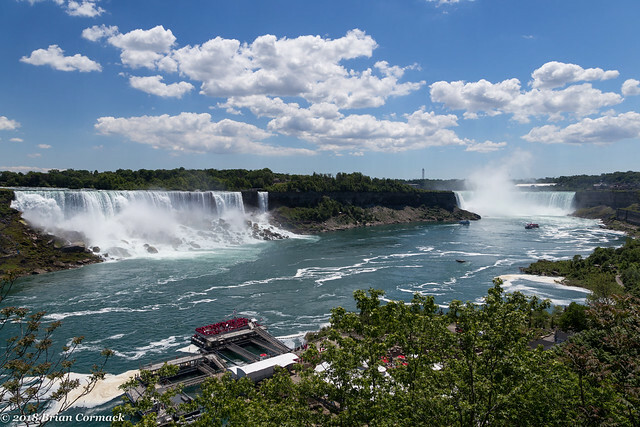 Just downstream is the American Falls, so named because the falls are located across the border in the US. 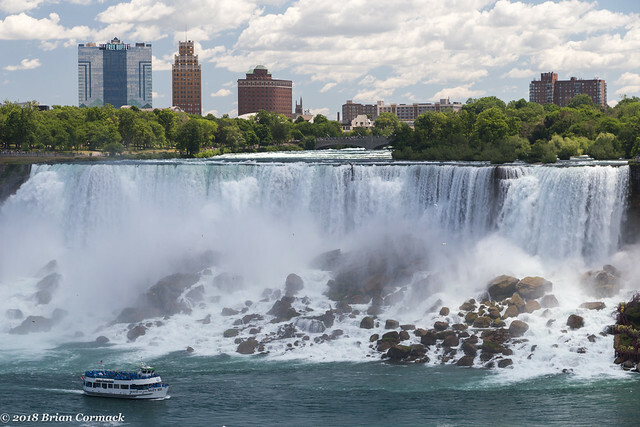 The American Falls are smaller than Horseshoe Falls, stretching 1,060 feet across. It is also shorter thanks to the pile of boulders that have accumulated at the base of the falls. 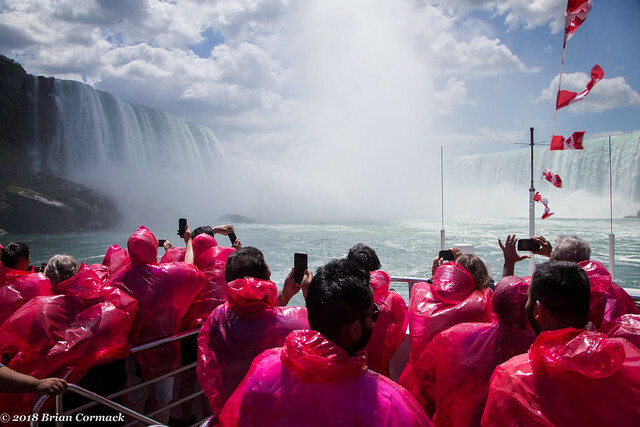 Next we went on one of the sightseeing boat tours, which departs after they hand you a stylish bright red poncho. The tour cruises up the choppy waters of the river, right by the waterfalls. This was the view of the American Falls and the third waterfall, Bridal Veil Falls. 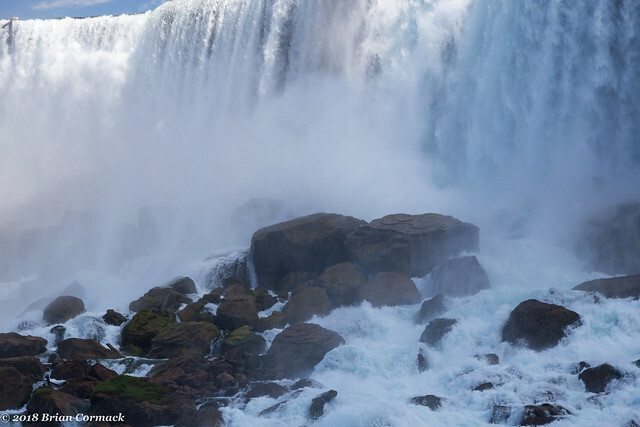 Bridal Veil is the small waterfall that flows just to the side of the American Falls. Just across the river is a large abandoned stone building, which is the old Ontario Power Company's generating station which was built in 1905. 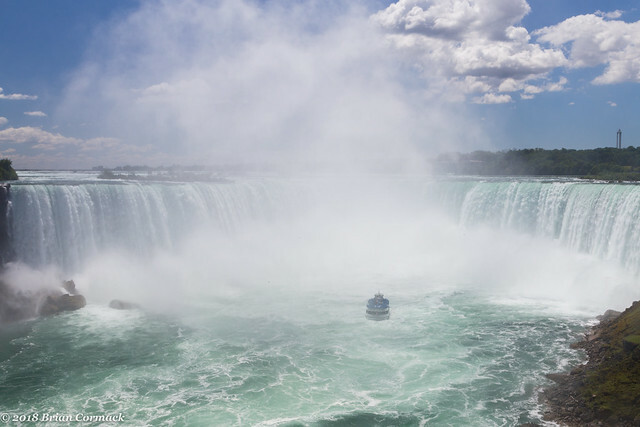 And the view from our sightseeing boat heading towards Horseshoe Falls. 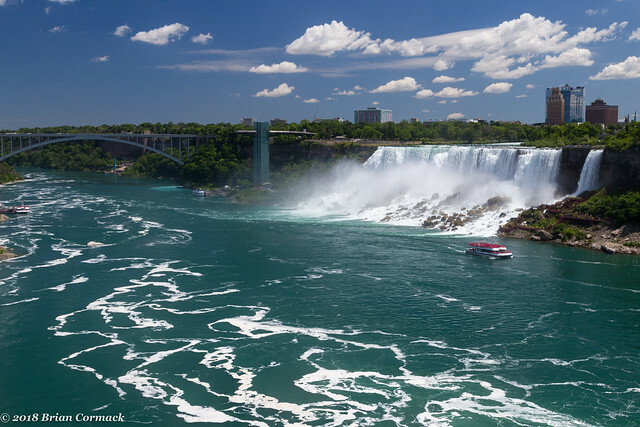 This is one of the most popular things to do for visitors at Niagara Falls, and there have been boat tours to the falls dating all the way back to 1846. The tour gives a pretty spectacular view of the falls, and I tried to get a few shots before hiding the camera under the poncho so it wouldn't get too soaked by the mist. The boat eventually headed back, passing back by the American Falls again. 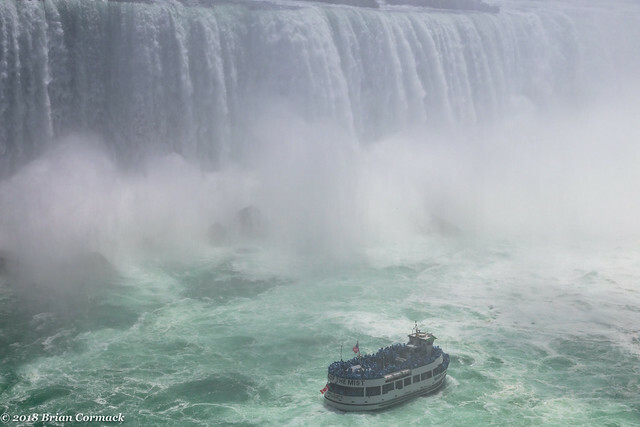 The boat had a recording of a tour guide who pointed out that several people have gone over Horseshoe Falls and have survived the plunge. 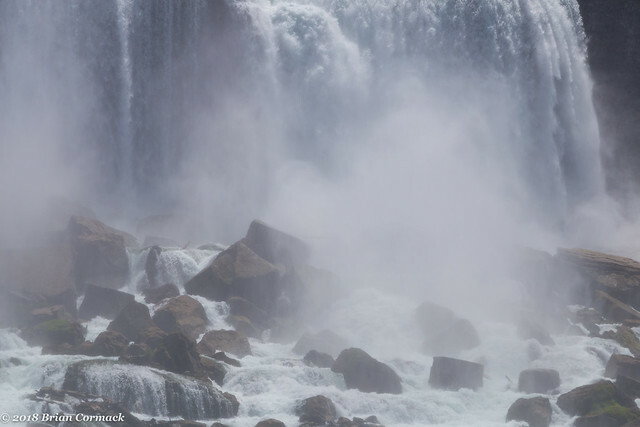 But not surprisingly, no one has ever tried to take a barrel over the American Falls. And the view again from the edge of the gorge, looking back at all of the waterfalls. 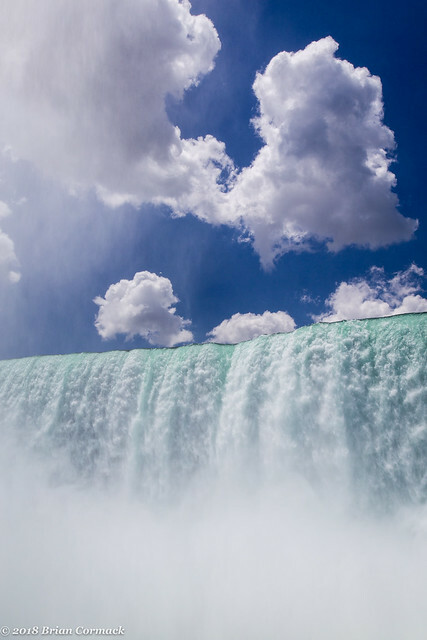 And a few more shots from the edge of Horseshoe Falls. If you look closely, in the rapids above the waterfall there is a little dark square sitting in the water. That's actually a barge that broke loose and almost ending up going over the falls way back in 1918. The two crew members managed to ground the boat in the rocks above the falls and were rescued, and the boat has remained there ever since. 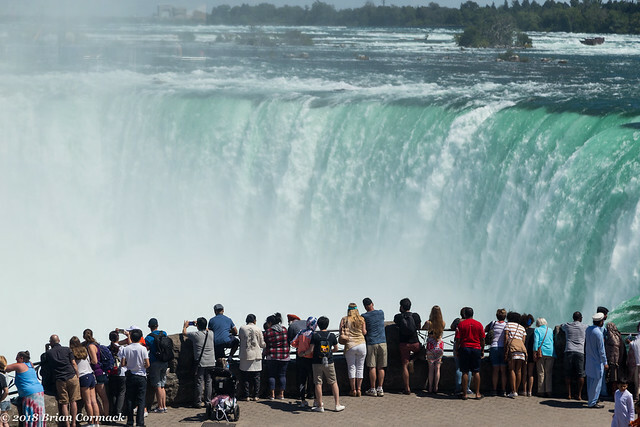 And one last shot from Niagara Falls, with part of the crowd of people perched on the edge overlooking the falls. After that we headed back towards Toronto but made a detour to visit a few wineries around the town of Niagara-On-The-Lake. We stopped at one that was owned by Dan Aykroyd and another one owned by Wayne Gretzky. Unfortunately we didn’t see any of the owners there, but we did get plenty of samples of wine. We needed to return the rental car by 7:00, so we drove off with what we assumed would be plenty of time. But we soon caught up with the traffic jams in Toronto, which slowed our progress to a crawl. With only about 30 minutes to spare, we exited the freeway and tried to take what seemed like a promising short cut to downtown. I had Google Maps going, which said that we would arrive at the rental car agency with just minutes to spare. We would just barely make it, as long as traffic wasn’t that bad. Well Toronto had other ideas. We were less than a mile from the rental car place when the road we were trying to take was blocked off for a huge street festival. We tried to detour around it, including barely making it through an alley that was probably about the size of the mini-van. But it wasn’t meant to be. We missed the drop-off time. But we just parked and got pizza instead, so it wasn’t all that bad.